Skyscript.co.uk :: View topic - Lost Thumb Drive-Help! 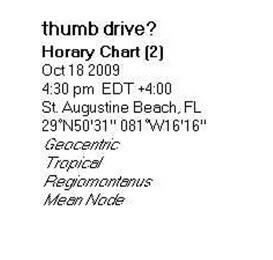 Posted: Sun Oct 18, 2009 9:14 pm Post subject: Lost Thumb Drive-Help! It looks to me as if I might find it. PoF in the first house is a positive sign. For the sake of simplicity, I am using L2-Mars as the drive. It is at 1 degree Leo, on the edge of the 6th house, with the Moon having just passed over it. This shows that I have recently lost it in a sixth house place? Hmmm. I thought maybe I had left it at Kinko's, but they didn't have it. It is not at my boyfriend's house, either. He has looked everywhere and can't find it. I last used the thumb drive on Saturday morning. It was in my own laptop. Then, I shut the computer down to go get my hair cut. I don't think I left it at the hairdresser's, but maybe I did? I need to find this ASAP!!!! All suggestions welcome!! I am completely freaking out about losing this. Allow yourself to be molded by your own talents. moon is combust so it is possible that even in plain sight it is "hiding" and difficult to see. I think that the hairdresser is a possible place and should be investigated. Besides that mars in the 6th cold also indicate your place of work, the doctor, your employee or maid, and Fido. The usual suspects should always be looked for: your children, if any, and your partner, if any, your purse, piles of paper, etc. There are several testimonies that thumb drive will be found! Ruler, Ma is in cadent house; cadent house means that item is either far off, or close by, but hidden and almost impossible to find. This will take time to find, usually indirectly by a third party. Ruler is near a house cusp, so look near a door, window, or passage between rooms. Ruler in fixed sign indicate low places, near the earth, well hidden, or on level ground. Fire sign indicating places near a wall, by a fire or heat source or near something that is iron or steel.Leo means that the item can be in a sun porch, a room in a house where you have more windows, play room, den, living room, room where children spend time playing, room or place lacking orderliness, place where gold plated articles are kept, room or places belonging to your children, room with expensive furnishings, a toy chest, pool and game room, children's bedroom. If you think you loose it out side that place might be a gambling house, betting parlor, bar, sports arena, theatre, dance hall, circus, poolroom, places of amusement, tavern, government building, golf course, race track. Ruler is in 6 house and 6 house means to look at work or someone at work may have it or have seen it or put it some place. A pet may have dragged it away. Look inside something: in a box, pocket (left), envelope, bag, drawer ( near earth) or cabinet suitcase or underneath something. Where you keep clothes, or in the linen closet (left). Often out of sight. Restaurants, doctors', lawyers' or agents' offices. The sewing room or studio in the home. POF is in 1st house in Pi. POF in 1st house means it is where you put . Look at place where you spends the most time, also the entry hall, front porch, front door and windows of a house. Look in your wearing things also. Posted: Mon Oct 19, 2009 10:57 pm Post subject: Thumb Drive Found! I was certain I had not left it at work. CERTAIN. And then . . . I got an email from the security department early this morning that they had found my ID and keys--the thumb drive is on that same key chain. Apparently, I had left it in a computer on Friday afternoon, when I was at meeting in the library (btw, this job is only part-time and I am not there all that much). The Moon in the horary is about two degrees past L2--perhaps that should have been a tip-off that I had lost the drive two days before casting the chart, even though I was convinced that I had lost it only one day before casting the chart. The PoF in H1 did correctly indicate that the drive was where I had put it. Mars on Cusp 6 did correctly indicate that the drive was at work. The moon combust and in fall correctly indicated that I 'couldn't see' the drive. I was really, really sure that I had used it last on Saturday morning, but I guess the heavily debilitated moon also shows that my memory was faulty. One really interesting thing: the logo of this workplace includes an image of an Lion. L2 is in Leo. Another interesting thing: after I read Goca's post, I decided to look under my rug, which is a pale sea-green color. I did find the cap that fits over the end of the thumb drive, but not thumb drive itself. Thanks to Goca and Yuzuru for helping to solve another horary mystery. Thnaks for update, so, as chart said it was found indirectly by a third party! posting for the first time, plz bear with me. I cant see the chart. Can you provide data to re generate the chart? or post a new chart? Welcome! My computer doesn't show the chart either, but I'm not surprised, because “Tanit” was asking about the problem also, a few month ago. This problem of deleted charts could be solved, if the data would be ADDITIONALLY given in the text. Johannes, that was exactly my thought! . . . However, it is hard to persuade people to do that and some of them don't want to do that for their personal reasons. I for instance learned that one of our members cannot see (on her screen) charts I posted using "postimages.org"; therefore, I started to include written data for anybody who has the same problem. Well, old habits die hard -- recently I was posting several charts at sports and speculation thread and I completely forgot to add the additional written data. Unfortunately I don't have another solution now so the best option at the moment is to have additional data. I found it in my collection of horaries back from November 2011. I am glad that I saved the chart so I can study it at a future time. As I am doing it now, I opened the topic and saw the missing data and will gladly share it with you. Geocentric, Tropical, Regiomontanus, Mean Node. Asc 6.42 Pis, MC 14.58 Sag. I might have some other lost-items-horaries from this forum, where the chart may no longer be visible, so if anyone is interested, let me know by giving the link and I would be glad to help.